iCloud is Apple’s over-the-air syncing, sharing, and storage service you have access to with your iPhone. Your data is stored in a remote Apple location, somewhere in North Carolina (at the time of writing), which is a good thing because if disaster or thieves strike your home and your computer breaks or disappears, your data is safe and sound. Purchased apps and media including music, iTunes Match content, TV shows, and books, which are all part of iTunes in the Cloud, as well as photos stored in Photo Stream don’t count toward the 5 GB. If you need more storage space, you can purchase an additional amount on a yearly basis directly from the iCloud settings on your iPhone. iCloud comes with Mac OS X 10.7.2 Lion or later, and the iCloud Control Panel 3.0 for Windows (Windows 7 or Windows 8) is available for download at support.apple.com/kb/DL1455. If you see the e-mail you used to set up your Apple ID, go to Step 5. 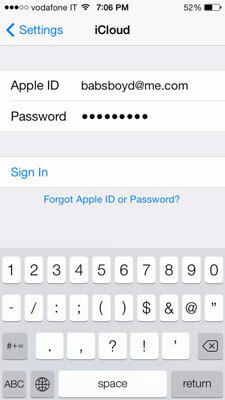 Type in your Apple ID and password and then tap Sign In. Your account is verified. iCloud only works with e-mail style Apple IDs. If your Apple ID is something like johnsmith, you must create a new one. You can still use your existing Apple ID and password for purchases in the iTunes, App, iBooks, and online Apple Stores but the Apple ID that uses yourusername@iCloud.com will control the iCloud functions. iCloud asks if you want to merge Safari data on your iPhone with iCloud. Tap Merge. iCloud asks to use the location of your iPhone, which enables the Find my iPhone feature. Click OK. 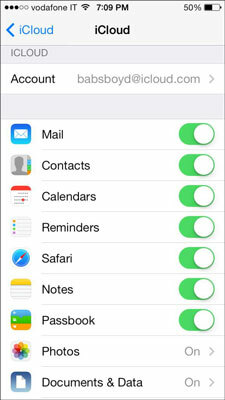 The switches you tap On indicate which data you want to sync with iCloud. Any changes you make on your iPhone are pulled into iCloud and pushed to the other devices, and vice versa, when your devices are signed in to iCloud and connected to the Internet. iCloud keeps all your devices in sync. When you tap out of iCloud Settings and open an app that you use and has content on another device or computer, such as Contacts or Safari, you find the information on your iPhone. The exception is Photo Stream, which automatically uploads as many as 1,000 photos taken in the last 30 days from your iOS devices — your iPhone, iPad, or iPod touch — or imported into iPhoto or Aperture on your Mac, and pushes them to the other devices and your computer. 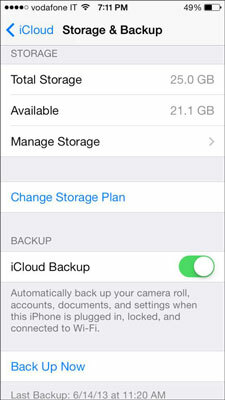 Continue from above to use iCloud to back up your iPhone (instead of using iTunes). Scroll towards the bottom of the screen and tap Storage & Backup. The Storage & Backup screen opens. A message lets you know your iPhone will no longer back up to your computer when you sync with iTunes. Tap OK. The Manage Storage screen opens, which shows you what is stored on iCloud. 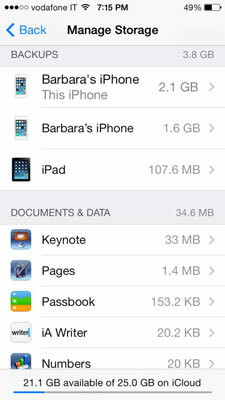 You can see that Barbara’s iPad and old iPhone are backed up to iCloud. Notice the Documents & Data section. The iCloud-enabled apps installed on your iPhone are listed. You may have their counterparts on your computer. 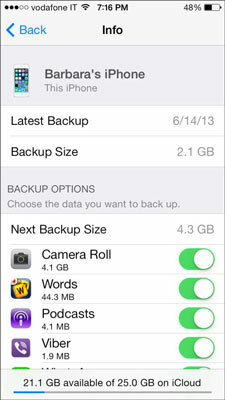 The apps on your iPhone appear listed in the Backup Options section. Tap the switches On or Off to select which kind of data you want to back up. For example, tap a drawing app On to back up sketches you make. Tap Back in the upper left corner, or swipe right to return to the previous screen and repeat to reach the Storage & Backup screen. Scroll to the bottom of the screen and tap the Back Up Now button.